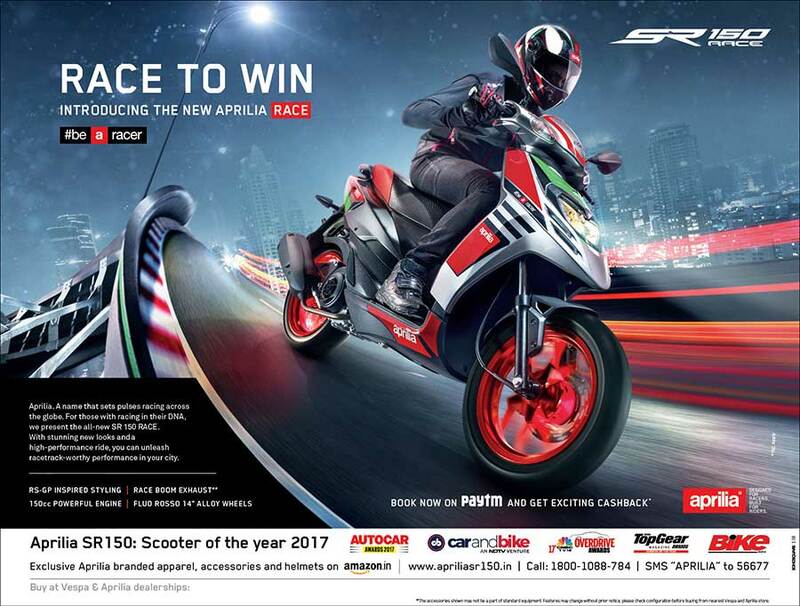 With the launch of the all new Aprilia SR150 RACE, Aprilia recently launched a new marketing campaign – #RaceToWin, targeting all Aprilia enthusiasts, the campaign has been rolled out across print, Outdoor and social media platforms representing the brand’s philosophy, #BEARACER. Brand Aprilia through its SR 150 range, has extended its brand DNA to riders on the city roads. The SR 150 RACE aims at further enhancing this and brings racy appeal and performance to city riders with innovative product design. – RS – GP inspired body visual theme and its powerful 150 CC engine with further faster acceleration and race boom exhaust, represent the Aprilia brand thought process ‘Designed for Racers, Built for Riders’. The campaign #RaceToWin targets these new age riders who would accept challenges in their daily lives, race against them and go on to win. Aprilia has a rich racing heritage with over 54 world titles under its belt, the SR 150 RACE reflects and extends the DNA of the brand. With the #RaceToWin campaign, we hope to capture all that the brand Aprilia stands for while cultivating a spirit of winning among the youth in the country. With the success of the SR150 moving ahead in full throttle, the SR150 RACE is set to appeal to the patrons who share the spirit of the brand.